For the sake of your sanity, I’m going to quickly fill you in what’s been happening in Marvel over the past few years. As crazy as it looks, many of these stories have actually been pretty damn good. I’ll post Comixology links to the titles where appropriate. You can also read most of them on Marvel Unlimited if you have a subscription. 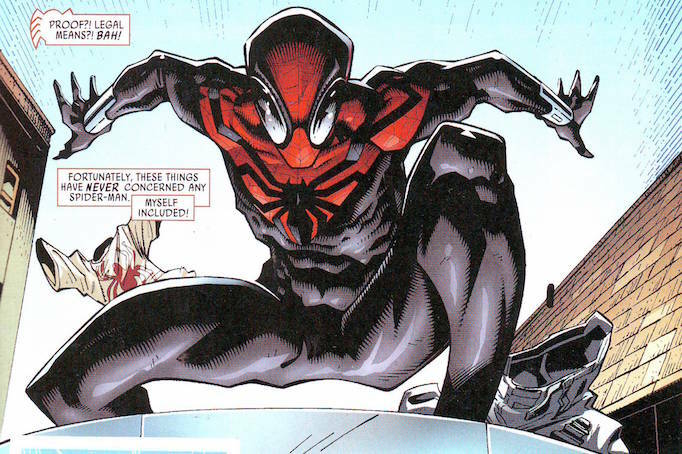 In the instant classic (and highly controversial) Amazing Spider-Man #700 (2013), Spider-Man was finally defeated by his arch-nemesis, Doctor Octopus, who switched bodies with him. Peter’s mind went into Otto’s frail body and died. Otto, having endured a forced mind-meld trip through Peter’s life, vowed to carry on as a hero: the Superior Spider-Man. As Peter, Otto established Parker Industries, using money loaned by Aunt May and her wealthy husband, J. Jonah Jameson Senior. What makes this extra-weird is that Otto was once engaged to Aunt May himself. (Roll with it, my friend.) However, Otto found that he was NOT a superior superhero, after all. He made quite a mess of things, in fact. Unable to rescue the woman he loved, Otto relinquished Peter’s body back to a fragment of Peter’s consciousness that had survived – in effect killing himself so that the real Spider-Man could live. Peter, who has no memories of the months that Otto was in control, has been struggling to keep Parker Industries afloat since. Based on that one new cover image, though, he doesn’t seem to be struggling anymore. During the Original Sin story (2014), Nick Fury whispered a secret to Thor that caused him to lose what makes him “worthy.” He lost the ability to wield Mjolnir. A woman took possession of the hammer and – using the old enchantment – gained the strength and power of Thor. Neither the original Thor (now called Odinson) nor Odin was happy about this, but they’ve begrudgingly accepted this. 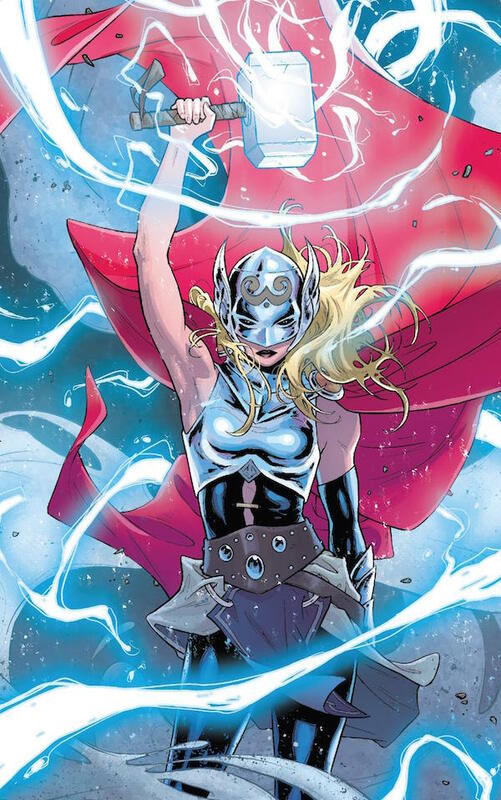 While the identity of the new Thor was Marvel’s biggest secret for a while, we now know that it’s Thor’s long-ago girlfriend, Jane Foster, who – in another twist – is undergoing chemotherapy for breast cancer. Her use of Thor’s powers is slowly killing her weakened body. Agents of Hydra injected Captain America (Steve Rogers) with a chemical that negated the original Super-Soldier treatment! He suddenly became a frail, 90-year-man, yet he kept his sharp, tactical mind. Steve gave his shield to his longtime friend and partner, the Falcon (Sam Wilson), and told him to carry on as Captain America. From what we can see of the new covers, however, Steve doesn’t look nearly as frail as he did last year! He’s bulked up a bit, so perhaps the Hydra chemical’s effects weren’t permanent. In Paul Cornell’s and Alan Davis’ excellent Wolverine run (2013, beginning here), sentient alien microbes took revenge against Logan by removing his healing factor. Thus, no more instant healing for the man who had made more deadly enemies than perhaps any hero in comics. Even popping his claws caused his hands to bleed. Time, foes, and karma caught up to Wolverine last year, and he died. Now, months later, it seems that X-23 – a female clone of Logan (note the two claws on her hands) who has been bouncing around the X-books for years – has taken on the genetic mantle. Cyclops (Scott Summers), while possessed by the Phoenix Force, recently killed Professor Xavier. The Beast (Hank McCoy), distraught by the current path of mutantkind and Scott’s actions, hatched a desperate and kind of crazy plan: He went back in time to when the X-Men were just getting started and convinced the teenagers to come back with him to our time, in the hopes that they could stop present-day Scott from inadvertently derailing all of Charles Xavier’s progress. Things didn’t go as planned. (See All-New X-Men from 2012.) The original X-teens, while stunned by the continuing anti-mutant violence of our time, didn’t want to return to the past, feeling they could do more good here and now – regardless of the temporal paradox that created. Teen Scott developed a romantic interest in X-23, which – considering she’s a clone of Logan – is pretty funny. Teen Jean Grey, though, had to come to grips with the fact that, as an adult in our time, she destroyed star systems and died. She also committed the mental faux pas of outing Teen Bobby Drake as gay, something that even the adult Iceman hadn’t come to grips with yet. This one is nuts, in a good way. In an alternate future timeline where supervillains have taken over the country, Logan lives in seclusion after having killed all of his friends. And then… well, no, I can’t spoil it. It’s too won derfully Cronenbergian. Just read Old Man Logan when you can. But the question now: How is he here in the present? In the background of nearly ALL of the main Marvel books were the Incursions. You see, the multiple violations of space and time that occurred in All-New X-Men, the Age of Ultron mini-series (which was fairly dull, to be honest), and other titles were causing fractures in the multiverse. On top of that, Molecule Man (an obscure Fantastic Four villain) killed the Molecule Man of another Earth, destroying that Earth in the process. A multiversal domino effect resulted, as universes began to collide and destroy each other, with Earth as the cataclysmic impact point each time. Behind the scenes, the Illuminati (Iron Man, Doctor Strange, Black Panther, Mister Fantastic, Namor, Black Bolt, and the Beast) secretly worked to protect our Earth – often by destroying the other Earths first. Yeah, it was morally dicey. Ultimately, there were only two universes left: ours and the Ultimate universe, home to Miles Morales and the Samuel L. Jackson Nick Fury before Samuel L. Jackson was cast as Nick Fury. Just as both universes were about to be annihilated, Doctor Doom – who’d been using science and sorcery to set himself up for JUST this moment – used the Molecule Man to rearrange reality and compile everything that was left into one world: Battleworld, where Doom now presides as an unquestioned, omnipotent god. And that’s the premise of Secret Wars and its various tie-ins. 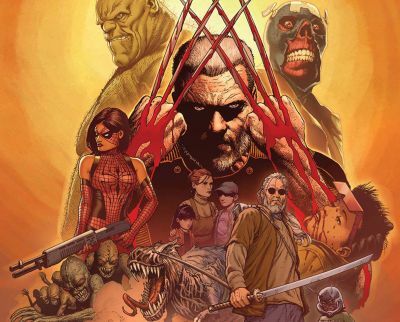 Obviously, Doom will not hold on to his godhood for long, but some of the cross-time and cross-reality effects will carry through to the new titles, hence Old Man Logan on the new X-Men team. As for Howard the Duck? Howard the Duck abides, dammit. Rock on, Howard. If your brain hasn’t melted and you have any questions, please comment below. Thanks!